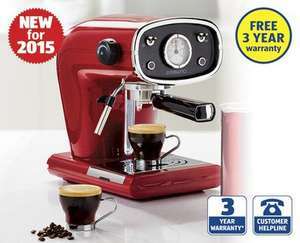 Start your day with a barista-style coffee with this premium retro inspired espresso maker. They are also selling separately a milk frother, Beans and an electric grinder. The milk frother is a pile of junk which blows out within a week after a couple of uses. Was also £49.99 at Lidl. This is rebranded machine for similar price on Amazon and doesn't get very good reviews. Just get a Nespresso, job done!